Since my blog about piano wires back in November 2014, I’ve continued to think about what it all means in terms of music. As I mentioned in my posting, my friend Keith Kopp provided the wires for me to look at. Keith is very generous with his time. I’ve seen him many times help out with music at various church and neighborhood socials. I’m always impressed that someone like Keith can clearly hear when an instrument is even slightly out of tune and also recognize how to fix the problem. I certainly don’t have the ear for that kind of thing. Keith mentioned to me that he can hear the difference between the two wires he supplied to me. I realized quickly I had no hope of picking that up with my insensitive ears. I then realized that Keith was saying he could hear the difference even when the two wires are tuned. I wondered what it was that he was hearing. I turned to Wikipedia for some insight and stumbled across an entry on “inharmonicity” which is “the degree to which the frequencies of overtones (also known as partials or partial tones) depart from whole multiples of the fundamental frequency”. I realized that the sound waves are travelling through the wires at slightly different rates due to elastic anisotropy coupled with grain-to-grain differences in orientation. Thus, while the average pitch of the wire will be in tune there will actually be a spread about that pitch. I might be able to estimate that spread using the principles of elastic anisotropy. 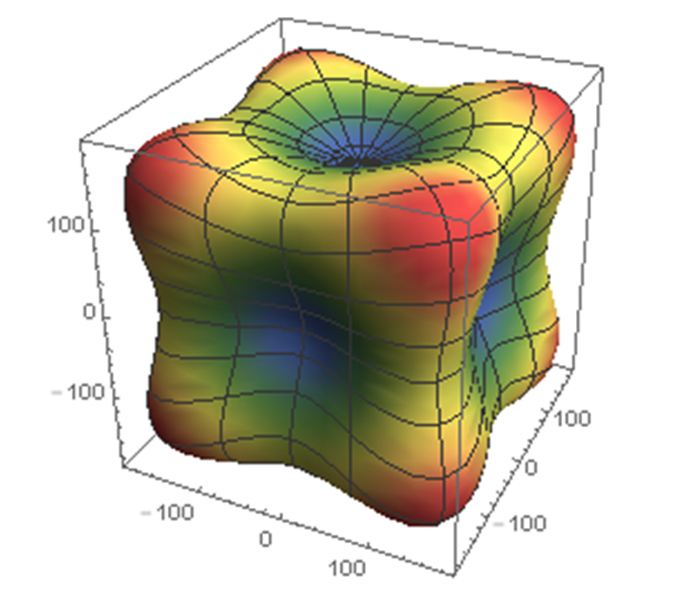 For a single crystal the elastic behavior is anisotropic as is illustrated in a plot for the elastic modulus for an iron single crystal below (courtesy of Megan Frary at Boise State University). I then calculated the distribution of elastic moduli parallel to the longitudinal direction of the wire thinking this might give me an idea of the differences in the distribution of pitches one might hear when a piano wire is struck. The results are shown below – on the left for actual elastic moduli and then on the right for how this might translate to a distribution of pitches. However, this second plot is only a schematic to illustrate my thinking – I have no idea how the elastic moduli variations would translate to pitch variations, the horizontal scale could be much wider, i.e. the flats and sharps could be much farther away from the center pitch and it may also not be a linear relationship. Also the choice of C is completely arbitrary – the actual pitch will depend on the diameter and tension on the wire. The bad wire (in terms of breakage), which according to Keith’s ear has a clearer sound than the wire less prone to breaking, has a narrower distribution of elastic moduli. Of course, I may be completely off-base as a “fuller” sound may correspond to the broader distribution as well. Perhaps what Keith can hear is the fine balance between clarity and fullness. So if my large set of assumptions is correct then, while I may not be able to hear the difference, I can at least see the difference in the texture data. When a picture is worth only a single word…. I’ve been at EDAX, and formerly TSL, for 20 years now, and given that OIM makes such beautiful images, one of the more ironic facts about my career is that I am color blind. That can sometimes make interpreting colored microstructural images a bit more challenging, and I’m very grateful for the flexibility in coloring within OIM Analysis that the software guys have put in for me (although I think they keep the default first 2 colors in phase maps red and green just because I won the last golf Burrito Open). This image is an Inverse Pole Figure (IPF) map showing the crystallographic orientation. While I’m sure if one were properly motivated, you might find the right vector in sample space to turn this IPF map into a test for colorblindness, even I can see that it spells out DOE. This very cool example was created by researchers at Oak Ridge National Laboratory, where they used an additive manufacturing process called Electron Beam Melting (EBM) to spatially modify the solidification texture development in a nickel-based superalloy. One can easily imagine that if you can control the local microstructure, you can then design and engineer the microstructure to optimize properties spatially for specific loads and applications. You can learn more about the work at Oak Ridge at: http://3dprint.com/19477/ebm-printing-3d-ornl/ or http://web.ornl.gov/sci/manufacturing/research/additive/. Other approaches have also been used to write into the microstructure, which I guess is the equivalent to changing the font and font size. In this example from the Else Kooi Laboratory, formerly known as the Dimes Technology Center, at the Delft University of Technology (http://www.dimes.tudelft.nl/EKL/Home.php) a laser beam was used to locally induce recrystallization in polycrystalline silicon. This approach has been used to develop thin film transistors used in things like liquid crystal displays. 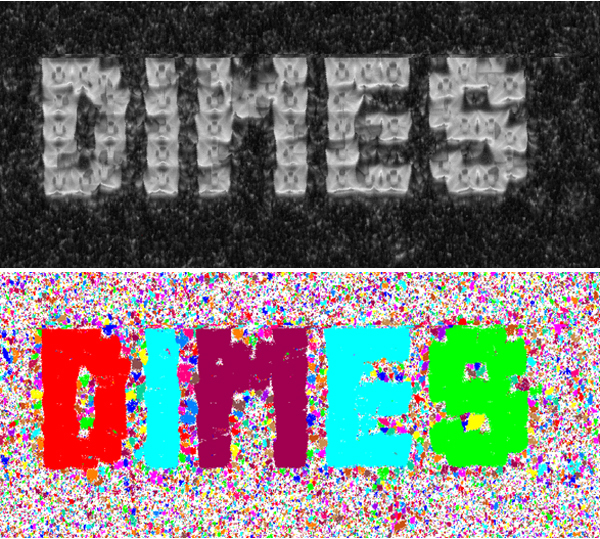 The writing is visible in both the OIM image quality (IQ) map(top) and the grain map (bottom), where adjacent measurement pixels of similar orientations are grouped together as grains, and then these resolved grains are randomly colored to show size and morphology. That approach gives each letter a different color. OIM has even been used to read the deformation in metals to recover destroyed serial numbers in metal objects like firearms. In the images below, an “X” has been stamped into a piece of stainless steel (a), and then polished to visually remove the marker (b). 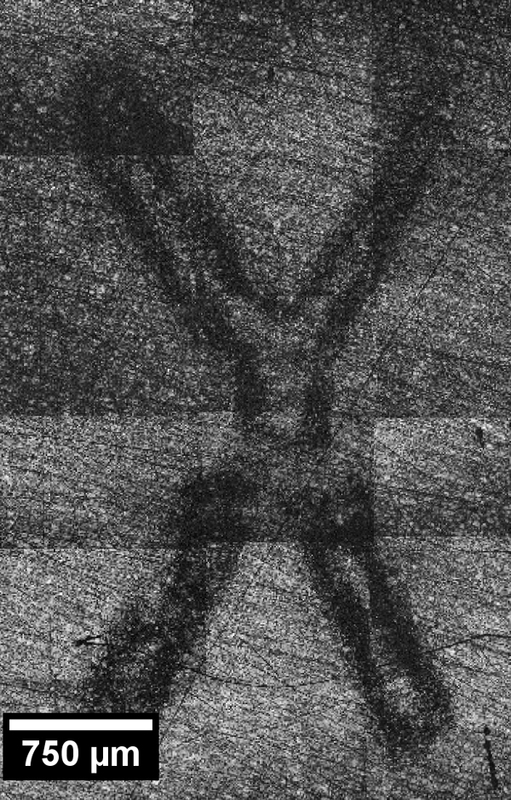 The residual plastic deformation present in the microstructure causes a lower EBSD IQ value which is used to image the stamped X. Years ago EDAX was featured on the TV show CSI for our Orbis µXRF product. With this forensic application, we are finally ready for a sequel. More information about this application can be found in a paper by Ryan White and Bob Keller in Forensic Science International (R.M. White and R.R Keller, Restoration of firearm serial numbers with electron backscatter diffraction (EBSD) Forensic Science International 249 (2014) pp 266-270) and at http://www.nist.gov/mml/acmd/ebsd-021115.cfm. 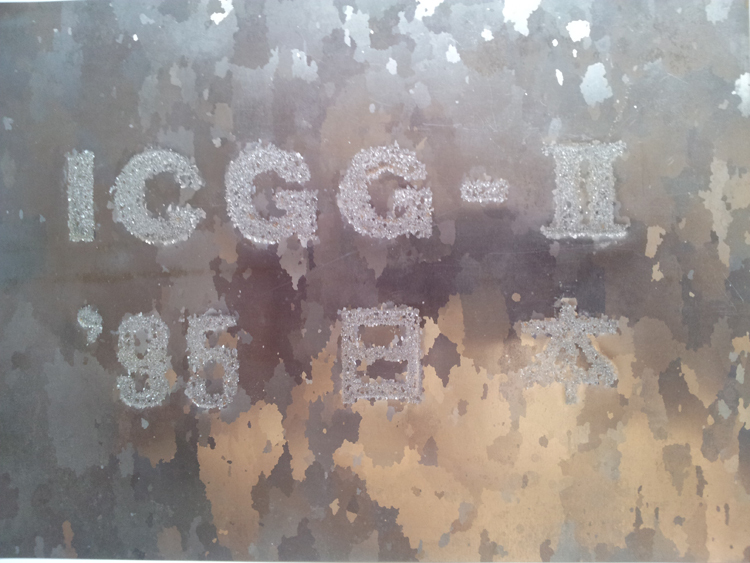 This sample was created for the International Conference on Grain Growth (ICGG), held back in 1995. In keeping with theme of this conference, the characters were placed by locally inhibiting the grain growth while the bulk material was recrystallized. So, while these pictures many not be worth a thousand words, they do contain at least a thousand grains. The fact that a few words have been engineered into the microstructure by various means is pretty incredible. Many thanks to Ryan Dehoff at Oak Ridge National Lab, Ryan White and Bob Keller at NIST, and David Field at Washington State University for allowing the use of their images for this blog.